The Rivenburgs were not ready to say goodbye to Baby Steffen. On the morning of his death, Steffen’s parents and grandparents were in court pleading for his life, but their cries were drowned out by the voices of others who literally argued for his death. The events surrounding Baby Steffen’s death on Thursday afternoon, June 8, are disturbing, and the family wants answers. They are hoping that an autopsy and investigation will provide answers, but time is running out for the family to gather the funds for an independent autopsy. Every day that passes, evidence contained in the tiny body deteriorates further. Grandmother Lisa Rivenburg told Health Impact News that time is of the essence. The prayer of thousands of people around the world was that Baby Steffen’s heart would beat and that he would breathe when doctors at Monroe Carell Jr. Children’s Hospital at Vanderbilt removed him from the ECMO machine. According to Lisa Rivenburg, that is exactly what happened. Even though his grandmother Lisa and parents Steffen Rivenburg Sr. and Patricia Tornberg wanted to give him the chance to live, they were repeatedly denied that chance, earlier that morning in court, and then in the hospital room that afternoon. The drug that the doctors gave to Baby Steffen was reportedly propofol, the “Michael Jackson drug” which was implicated in the death of the King of Pop Music. rapidly induces unconsciousness and apnea. People stop breathing within seconds of being given the drug. The issue with propofol is that it can make the patient’s brain forget to breathe. It’s not a side effect or complication; it’s just what it does. Baby Steffen’s family wants to know why doctors felt that the drug was necessary. Just a short time before he was removed from life support, Baby Steffen was kicking his feet and moving his arms in response to his family. While his parents still pleaded for his life and for time with their baby, Lisa tried to record her grandson’s final moments. I’m getting ready to arrest you. She said that he started to reach for something. She didn’t know whether he was reaching for his handcuffs or gun or something else, but she stopped recording. Just that morning, Dr. Harold Andrew Smith reportedly described Baby Steffen as “brain-dead” to Judge Wayne Shelton. The family had been prepared to go to the hospital when they were all called into court for an emergency hearing. 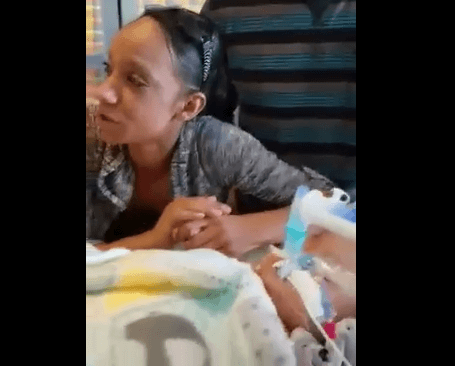 No one was able to record the heart-wrenching final moments of Baby Steffen’s life. Doctors took the baby off of the ECMO machine, and the family had a few minutes of hope that he would survive when he breathed on his own and his heart continued to beat. They will always wonder if he could have survived if he had not been drugged a few minutes later. Lisa did not get her phone back until she was seated in her car. She and the baby’s parents were escorted under armed guard out of the hospital. We were treated like criminals! 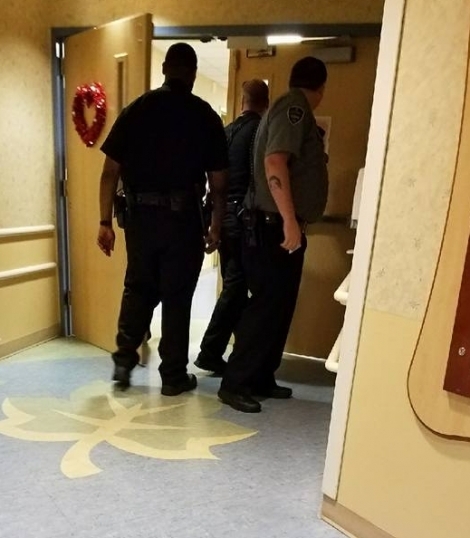 The family was escorted in and out of Vanderbilt hospital under armed guards. Source: Reunite the Rivenburgs Facebook page. Did “Protective” Services Cause Harm? Though Baby Steffen was born with Down Syndrome and congenital heart defects, he was healthy when he was taken from the family by the Department of Children’s Services (DCS) at 3 months of age because his parents missed 3 doctors appointments. On each occasion, the parents had car trouble, so they rescheduled the appointments. He wasn’t sick; they were just routine appointments. Steffen’s mother Patricia told us that she would have found a way to take him somehow if he had actually been sick or truly needed to go to the doctor. But that was not the case. Other parents of children with congenital heart defects have reported that their children were non-symptomatic, and some even outgrew the heart defects. Had Steffen been showing symptoms of problems, car troubles would not have stopped the family from getting him help. They had been told that he would “likely” need surgery at around 6 months, but he was doing well when he missed the appointments. DCS seized the baby during one of Steffen’s rescheduled appointments at Vanderbilt hospital, and they seized his big sister Annalise from her first-grade classroom at school, placing both into foster care. Both children were given numerous vaccinations the very next day, and within just 2 weeks, the once-healthy baby Steffen became very ill with a serious viral infection. Several heart surgeries followed within rapid succession. Supporters of the family have questioned the protective ability of Child Protective Services, and point out that the actions of DCS caused far more harm to Baby Steffen than a few missed doctors appointments did. Shortly after Steffen’s death on Thursday, the family was alarmed to learn that DCS might not release his body to the family, and they might never have the answers they desperately seek. Advocate Mattie Shae Mitchell with Liam Changed the World Inc., a non-profit organization dedicated to raising funds for sick children and helping with funeral expenses, started making phone calls. The family was able to arrange for Steffen’s body to be moved to a secure location. Now the family is seeking funds for a private autopsy that they hope will provide some answers. Supporters have set up a Facebook page for the family called Help for Baby Steffen to get an autopsy and burial. Please consider helping if you can. Baby Steffen’s big sister Annalise also remains in foster care. The family’s next hearing on their case is scheduled for June 19. They plan to appeal Judge Shelton’s ruling.